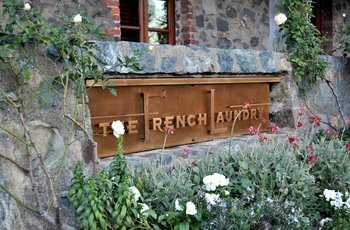 The French Laundry is one of the most iconic restaurants in the Napa Valley and one of the best restaurants in the world, with three Michelin stars to prove it. 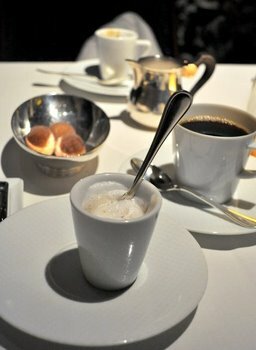 The restaurant belongs to Chef Thomas Keller, who has been serving a beautiful nine course tasting menu there since 1994, when he bought the building (formerly an actual French Lanudry, but operated previously as a restaurant) and opened his restaurant. The tasting menu changes daily and never features the same ingredient more than once, as it is structured to surprise you with new tastes as you are served each course. I ate at the restaurant once before, back in 2004, and one of the things I regret about that memorable visit was that I didn’t take any pictures. I didn’t make that mistake this time, so I can share a peek at the wonderful meal I had there – and make sure I remember it myself! This post is photo heavy, so be patient if the page takes a moment to load. 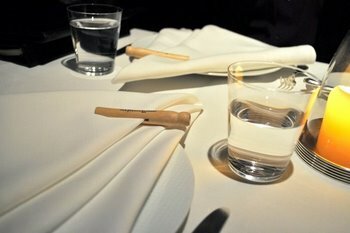 A meal at the French Laundry opens with an amuse bouche or two. These are small, bite-sized snacks that are intended to awaken the palate. 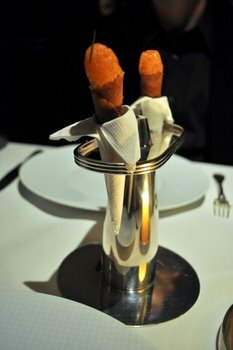 We started with some small, cheese-filled gougÃ¨res (essentially savory cream puffs) and with sesame tuile “ice cream cones” filled with green onion creme fraiche and topped with salmon tartar. After the salmon, we started on the actual tasting menu. 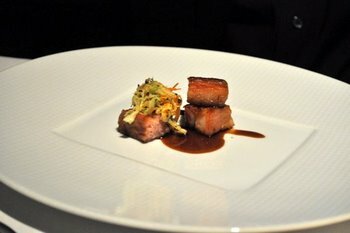 The menu is structured to go from lighter dishes to heavier ones, in addition to not using the same ingredient more than once (aside from salt, etc. 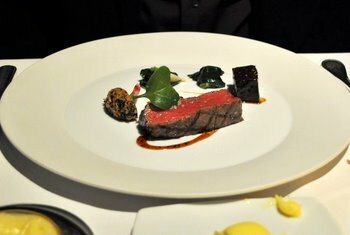 ), so we opened with a salad course and moved on to fish courses and then meat courses. 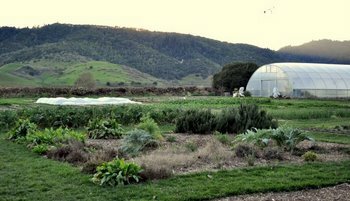 Much of the produce is actually grown by the French Laundry, which maintains a 5-acre garden across the street from the restaurant in addition to other farming property near by. 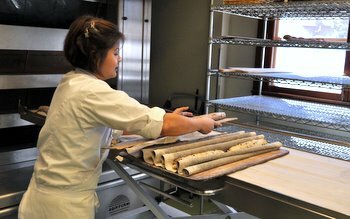 The rest of the ingredients used are sourced based on quality, primarily from local producers. 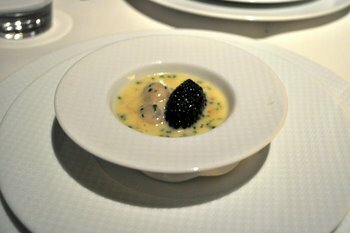 The first course was “Oysters and Pearls,” a signature dish that has been on the menu almost since the restaurant opened. It remains popular even with people who have eaten at the restaurant many times and it’s not hard to see why. 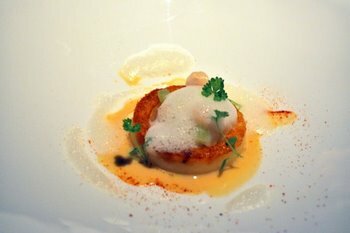 It consists of a “sabayon” of pearl tapioca with Island Creek Oysters and White Sturgeon Caviar. Everything in the dish has an element of roundness to it and it is great fun to eat, as well as being flavorful. I’m not always a big fan of caviar, but the flavor and texture here was lovely. 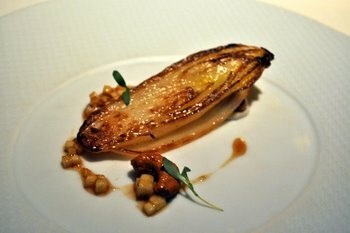 The second course was an Endive Salad, with a roasted endive that was served with a bruioise of caramelized bananas, candied cashews, cilantro and madras curry. It was a great combination and the banana in particular was a standout. 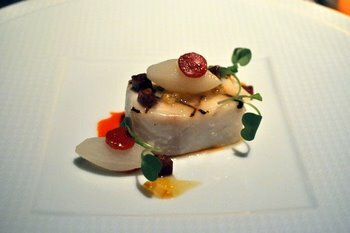 The next course was Frilled Fillet of Atlantic Cobia, a swordfish-like white-fleshed fish. It was served with chorizo, sunchokes, piquilo peppers, arugula and candied meyer lemon pieces. The fish had a wonderful firm texture, but I could have eaten quite a bit of that chorizo, which actually had waygu beef as a component. There were many bread options to choose from as bread was served, but it was impossible to resist the mini pretzel brioche baguettes. 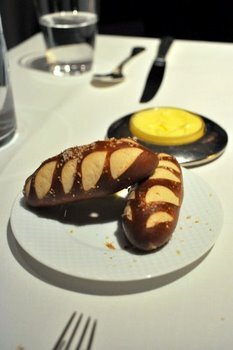 They were served with both unsalted and salted butter. 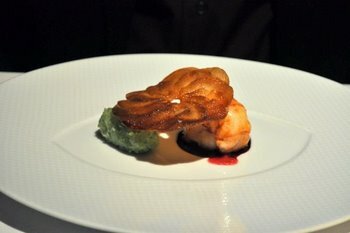 The next course was “Beets and Leeks,” a butter-poached lobster tail served with a side of leeks, a super-sweet beet essence and a large potato crisp. Not being a fan of lobster – although the beet essence was amazing – I substituted this course for one on the vegetarian tasting menu. I tried a Sweet Corn Chowder, which came with confit yukon gold potatoes, celery, razor clams and a clam foam. Great combination. We were given a choice for the next course, so we opted for one of each item. First up was Salmon Creek Farms Pork Belly, which was cooked until it was meltingly tender and crisp on one side for contrast. It was served with a cabbage and ginger slaw. 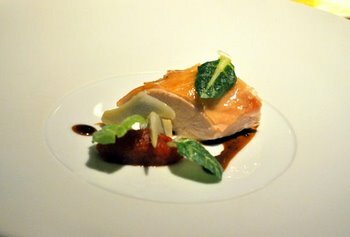 The alternative to this was a milk-poached Poulard (chicken), which also came with very crispy skin and was served with baby artichokes and a san marzano tomato compote. The pork belly was my favorite, I have to admit, but the juicy and tender chicken was a lovely, simple dish. The next course was easily my favorite of the night. Snake River Farms “Calotte de Boeuf Grille.” This course was a lightly grilled American-style kobe beef that was rested in butter, paired with a piece of glazed brisket that had been cooked sous vide for two days to make it as tender as possible. Both were amazing, but the grilled beef was so tender and buttery that you almost didn’t need to chew it. Wow. We savored that meat course for a long time, but the cheese was a welcome change when it came out. 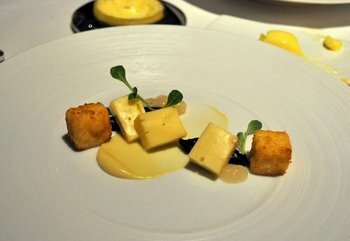 The cheese course featured “Boho Bell” cheese, crispy polenta, French prunes and dijon mustard. 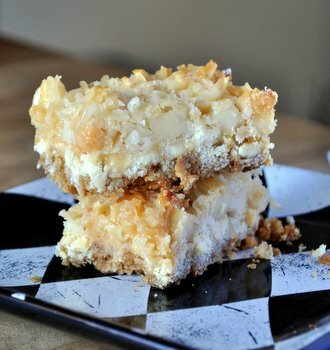 The cheese was very creamy, and all of the flavors worked very well together. I might even think about doing a crispy polenta with other cheeses in the future. The palate cleansing sorbet was delicious and beautiful to look at. 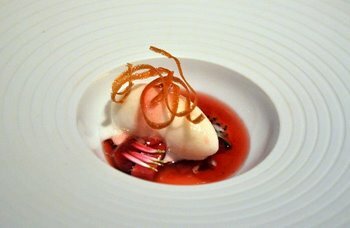 It was a Wildflower Honey Sorbet, served with a chilled hibiscus and pink peppercorn consomme, poached rhubarb and germinated basil seeds, garnished with a bit of tuile cookie. The peppercorn was mild, so the honey really came through with every bite. Finally, we were ready for dessert. Again, we were offered a choice of desserts and got one of each. 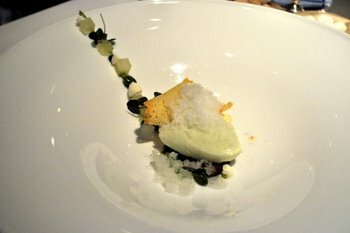 First was a granny smith apple sorbet with shiso gelee, lemongrass snow and several different preparations of pistachios. It was lovely – especially the lemongrass snow all over the top of the dish. The other dessert was a hazelnut cream-filled chocolate cake that was topped with a white chocolate truffle that was filled with mascarpone cream, almond milk and sour cherries. 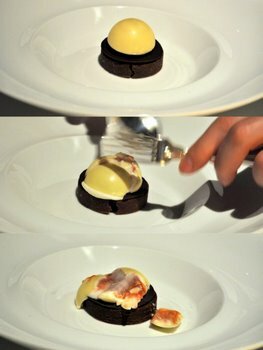 You needed to crack open the truffle before eating to let all the flavors run together. After dessert, we had more desserts. 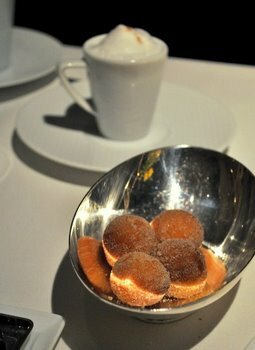 I loved the Coffee and Donuts, with a cappuccino semifreddo topped with hot milk foam and warm, sugary brioche donuts. 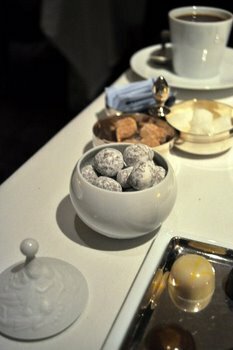 We also had chocolate-covered hazelnuts and a variety of house-made truffles, as well as a few cups of actual coffee. They wrapped up the shortbread to take home with us because it would have been impossible to eat another bite at the end of this meal. 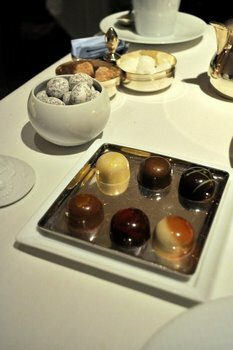 That is a taste of my tasting menu and I have to say that the French Laundry is a dining experience definitely worth trying, for the food, for the outstanding service and for the chance to have a really amazing fine dining experience. I won’t be dining there often (although I certainly wouldn’t mind!) but in a few years perhaps I’ll have the chance to go back again and can compare notes with this visit! Thanks for sharing this amazing experience! I dream of one day going although every time I’m in California it’s to visit my grandmother in Carmel, not much opportunity to travel far afield. Your drool-worthy pictures will just have to tide me over until I get the chance to go myself. Aah! I am a recent addition to your blog’s followers, and I haven’t yet been disappointed by a post. This one in particular left me awestruck. This restaurant is definitely going on my bucket list of places to eat before I die. Thanks! This brought back very fond memories from my visit there, I’d love to go again! It’s all so tiny! I’m glad you had donuts though, looks sooo good. I love the Napa Valley! Great article. Next time I am in the Napa Valley area this is going to definately be a stop.